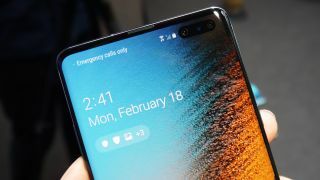 Once Samsung launched the Galaxy S10 range there was one phone it announced that wasn’t released with the rest – the Samsung Galaxy S10 5G. But, the phone is now available for buying, if you live in the correct place. Samsung officially confirmed the release of the device in a post on its newsroom, stating that it’s available to buy in South Korea immediately, even though there’s no word of an international release. What 5G phones can we expect? The Samsung Galaxy S10 5G was launched to tie into the release of South Korea’s 5G network, one of the first consumer 5G grids in the world ahead of similar networks launching in various other countries. Galaxy S10 Plus Privacy Glass Screen Protector – 3D Full Coverage Tempered Glass Screen Protector for Newest 2019 Samsung Galaxy S10 Plus. Galaxy S10 Plus Screen Protector Privacy Glass – 3D hot bending technology-Comfortable touch feeling of original glass screen edge, perfect fit Samsung S10 curved screen, no even a little gaps, all-round protection for your cell phone. S10 Plus Tempered Screen Protector Privacy Glass– 9H Hardness-Scratch-resistant screen protector can effectively protect your device from unwanted scuffs and scratches by knife, keys and some other hard substances. Attention-Due to this is a full coverage screen protector, it will add extra layer to the screen, it can not compatible with any hard or tight cases which doesn’t leave enough room for this layer. Please note that the fingerprint function will not work, this is because the glass is thick and distorts the touch. If your looking for a finger print function please try our TPU screen. Because we are the best!!!! 1.Compatible with Samsung Galaxy Note 9 (Release 2018); Samsung Note 9 screen protector tempered glass not included. Will not be compatible other phone NOTE 9 ONLY. It is very difficult to produce Gorilla glass in the front because of edge to edge side. But our silicone inner layer is higher than the screen, its effective protection Note 9 shockproof. Galaxy Note 9 Gorilla Case Black Aluminum Metal protection. Note 9 Cases and Covers. Samsung Galaxy Note 9 Cases Aluminum Metal and 100% Waterproof Galaxy Note 9 Cases. Make sure you buy a screen protector with your case. The Waterproof Galaxy S10 Plus case is your ultimate protection against what you or nature can offer. The Waterproof Galaxy S10 Plus case has stylish colors to choose from to fit your taste. Waterproof Galaxy S10 Plus case is Waterproof, Dust Proof, Snow Proof, Drop Proof, Shockproof and it has a HD clear scratch resistant screen guard to complete the protection. Super slim body provides layers of protection and doesn’t add much to the size of the Galaxy S10 Plus . Waterproof Test: Please Put a Tissue in the case for test. If the tissue got wet, pls check it again or email us. The Waterproof Galaxy S10 Plus Case must be sealed for your case to be waterproof. Waterproof Galaxy S10 Plus Black Has some features that will not work with the case on. The Waterproof Galaxy S10 Plus Case is great for fishermen, construction workers, and anyone that works in the elements. This case is meant to protect against extremely hard impacts! Best protection we offer,If you brake your cellphones due to falls, this case will really help you.If you love to do outdoor sports and want to protect your Phone, this hybrid case is perfect for you due to its PC and silicone build giving it a shockproof and dirt resistant design.If you or your loved ones play sports or tend to be in situations where their phone can get easily damaged, buy this Phone case today! iPhone X credit card cases and covers. iPhone x credit card case -— 100% brand new and high quality. iPhone x credit card case -— Card pocket inside of the case provide you a convenience for Money, Cards, Driving License or other stuffs. iPhone x credit card case — The Inter Layer is a soft silicone Rubber cover, better for cushion while bumping or shock; the outer layer is a hard. iPhone x credit card case — Plastic shell with slide back. There is a card pocket between the inner layer and the outer layer. iPhone x credit card case — The case can carry 2-3 cards with a paper money inside by maximum or carry 1-2 credit card. iPhone x credit card case — Easily access all functions without removing the case. ADVANCED TECHNOLOGY HD BALLISTIC GLASS – Made from the highest grade Japanese Asahi glass, our multilayered screen protectors are made with polished, rounded edges and provide 99.99% iphone x gorilla glass HD Clarity and 3D Force Touch Accuracy. The iPhone X screen protector has a curved edge, the screen protector doesn’t fully cover the iphone X screen. This is because it works with any phone case and the corners will not come off! This screen protector only covers the flat surface reducing the risk of bubbles. We’ve designed our screen protector so that it’s easy to install, durable and offers maximum coverage. The best iPhone X screen protector for your iPhone X. CASE FRIENDLY – Works with iPhone X cases and won’t interfere with installation. iPhone X Screen Protector Clear – iPhone X Screen Protectors – Gorilla Cases EASY AND BUBBLE-FREE INSTALLATION GUARANTEED: Precise laser cut to fit perfectly on the iPhone X front body and will easily attach to the screen smoothly and hassle-free. iphone x gorilla glass If there is a spot, bubble, or section that doesn’t adhere, just peel off the screen protector and install it again. New Galaxy S8 and Galaxy S8 Plus Cases and Covers! As the technology is evolving, the phones are getting smarter and slimmer. In the slim body, the entire device is so perfectly arranged that it puzzle the human mind. However, this easy to handle and stylish technology is making the smartphones vulnerable. Recently the news of Samsung galaxy s8 launch has created a buzz among the technology lovers. People are excited to see this new phone. As the company has claimed that, it is about to be the slimmest smartphone you could have ever utilized. You might be excited about the cell phone but we are worried about its vulnerability. You must be aware of the fact if a phone is slim it is prone to damage on a single fall. Its screen might also break if someone accidentally sits on it. So to protect your phone we have the Samsung Galaxy s8 cases for you. Protect your Samsung Galaxy s8 with the s8 cases. It has been manufactured with the high-quality material that will protect your phone for a long duration. Once the cover is on your galaxy s8 you will not have to worry even if your phone has been thrown from the building. The Galaxy S8 Plus Case will perfectly fit around your smartphone so that you will not get irritated with a loose cover. The best thing is that kids will not be able to remove the Samsung Galaxy s8 cases so your phone will be safe in all hands. You can have the cover customized with a special design in case you are not the fan of a plain black cover. In case you are worried that the Galaxy s8 case will not let your phone look slim do not worry because that issue has also been solved by the manufacturer of the case. If you want your Samsung Galaxy s8 to be protected from all kinds of damages make sure that you buy the Samsung Galaxy s8 cases. When you have spent thousands of your hard-earned money on a phone you will never like it to break because of a minor fall. So make sure that you buy the case today because it will provide the protection you desire. Leave a Comment on New Galaxy S8 and Galaxy S8 Plus Cases and Covers! Gorilla Cases Galaxy S7 Fashion design,looks very cool,the case for man,soldier,warrior,Outdoor enthusiasts,Rider,Truck driver and every people want well protect the Samsung Galaxy S7 with Gorilla Cases. NOTE: WEATHER PROOF, CAN SIMPLE PROTECT YOUR MOBILE FROM THE RAIN OR THE SUDDEN WATER DAMAGE, IT CAN FACE WATER RESISTANT, AND RAIN PROOF, BUT NOT PUT IN WATER. Tempered glass protecting the fragile screen with anti-fouling and anti-glare function. The silica gel seal packing and gasket, let the phone has a good Water Resistant function, although does not support depth diving such as being used for swimming or being soaked in the water, but meet the rainy day or go to the seaside completely not afraid of water. General sand, dust can’t get into it ! If you wanna the others model or type case,please entry Gorilla Cases,you will find more bigger world! Waterproof iPhone 7 Cases Coming Soon! Waterproof iPhone 7 Case Coming Soon! Update: It may be time to wave goodbye to the camera bump and antenna lines, with the iPhone 7 sporting a sleek new look. With the iPhone 6S Apple delivered its best handset yet, but aside from sporting some fancy new 3D Touch technology, it was also very similar to the iPhone 6. That was to be expected – after all, Apple typically only overhauls its handsets once every two years, but that overhaul is due with the iPhone 7, so we’re expecting and hoping for big changes: think a whole new design, piles of power and a bunch of new features. The leaks, rumors and reports are already ramping up, although the iPhone 7 probably won’t arrive until late 2016. We’ve collected all the latest from around the web and beyond for you below, to give you the clearest picture possible of what you can expect from the new iPhone. Fancy Android? Here’s everything you need to know about the Samsung Galaxy S7 iPhone 7 Case. If we were betting people we’d say the iPhone 7 will probably arrive in September 2016. Apple tends to stick to a schedule, and the last few iPhones were launched in September. But according to a ‘reliable source’ Apple might actually bring it to market earlier. Sadly, how much earlier is unclear, but it will take a while to even finish development and manufacture of the phone, so we wouldn’t expect to see it before the summer. There are numerous reports pointing towards an Apple event in March, although the iPhone 7 is highly unlikey to make an appearance then. We’ll probably see the iPad Air 3, iPhone 5SE and Apple Watch 2 instead. The iPhone 6S looked a lot like the iPhone 6, but it’s likely to be all-change with the iPhone 7. Exactly what form that change will take remains to be seen, but there are some rumors. For one thing, it could be even slimmer than the 7.1mm-thick iPhone 6S; Ming-Chi Kuo of KGI Securities reckons it’ll be dropping to between 6mm and 6.5mm thick. That sounds unnecessarily slim to us, especially as it could cause the battery life to take a hit, but the Samsung Galaxy S6 is only marginally thicker at 6.8mm, so it’s possible. If TSMC makes the chips, as has been rumored, then some space could be saved, which might help Apple slim it down without making sacrifices in other areas. Another rumor suggests the iPhone 7 will have an all-metal design with a bezeless display. It would be a big change for the iPhone design, but bringing in a new kind of screen technology would be a sensible move for Apple. The iPhone 7 could be built to last too, as according to Mac Otakara there are a number of iPhone prototypes with “ruggedized” features, which could mean a water- and dust-resistant phone is on the way. Another suggestion of a waterproof iPhone 7 comes from the Apple supplier Japan Display. The supplier has come up with a new technology called “Pixel Eyes”, that is now in its second generation, but it makes it easier to use the screen while you have wet fingers. That’s always an issue with waterproof phones such as the Sony Xperia Z line, so the fact Apple’s main supplier is looking to stop the problem may be a big hint at what the iPhone 7 will do. We could also be in store for the thinnest iPhone ever, as rumors suggesting Apple will ditch the bulky 3.5mm headphone jack begin to gather pace. That would see a great dependence on Bluetooth headphones – could we also see a wireless set of buds included in the box? A new design tweak rumor which will likely please many suggests Apple will ditch the camera bump which has been present since the iPhone 6/6Plus – with the firm going for a sleeker finish on the iPhone 7. As well as a totally flat rear, it could also be uninterrupted as the same report points towards the removal of the antenna bands. The iPhone 7 could be in for a big resolution jump if a DigiTimes source is to be believed, as Apple is apparently likely to move to glass-on-glass screens, which in turn opens up the possibility of a QHD or even a 4K display. A lot of Android phones already have QHD screens, and the Sony Xperia Z5 Premium is 4K, so it’s possible that Apple will pump up the resolution of its next flagship, but given that the iPhone 6S isn’t even 1080p we’re sceptical that it’ll get anywhere near 4K. If the iPhone 7 does get higher resolution it might get bigger too, especially as rival phones are growing in size all the time. We’re not convinced though – we’d still bet on seeing 4.7-inch and 5.5-inch models. Then there’s the first image of the LCD backlight on the iPhone 7. It comes from trusted French blog NoWhereElse and shows the panel from the iPhone 7 up against the iPhone 6S. All the connectors are in different locations around the phone suggesting there will be a few design changes on the next iPhone. A jump in resolution might not be the only way the iPhone 7 imitates Android though, as there’s also talk that it could switch from an LCD display to an OLED one, much like Samsung uses on most of its phones. iPhone 7 Case. One new rumor suggests the iPhone 7S will be the first Apple phone to feature an OLED display. The rumour comes from Apple telling supply chain sources that it will be switching from LCD panels to OLED panels in the next couple of years. Sadly it doesn’t seem like the technology will be here in time for next year’s iPhone 7 and we’ll have to wait for the iPhone 7S. That said, analyst Ming-Chi Kuo has dismissed the rumor, arguing that Apple won’t likely switch to AMOLED before 2019. The iPhone 7 screen could be hard to smash, as an Apple patent has been unearthed showing bumpers which burst out from the edges of the screen to ensure it doesn’t touch the floor when dropped. Patents often don’t turn into products, but you never know – and it would certainly be nice to see a stronger screen. 3D Touch is bound to make a return, though it’s likely to be improved in some way, perhaps by enabling you to scroll through the previews of content you ‘peek’ into, rather than just having static previews. The iPhone 7 is likely a way off yet, so it’s main rivals won’t have launched yet either. But as usual Samsung is sure to be a big competitor, with the Samsung Galaxy S7 in particular likely to give it pause. Rumors point to a big screen, a spectacularly powerful processor and all the style and features found in the Samsung Galaxy S6. The HTC One M10 is likely to be a worthy alternative to Apple’s handset too. Coming from HTC it’s sure to look good, but little is known about it so far. iPhone 7 Case. There’s also talk of a 4.0-inch iPhone 7C in the works. We haven’t seen a C edition of the iPhone since the iPhone 5C so we expected one to launch alongside the iPhone 6S, but sadly there was no news. The latest rumours suggest we’ll see one alongside the iPhone 7, but it’s not quite clear whether it’ll be called the iPhone 6C or iPhone 7C. Some sources have been whispering about the phone coming with a metal back, unlike the cheap feeling plastic iPhone 5C. Apple overhauled its camera tech for the iPhone 6S, replacing its old 8MP snapper with a shiny new 12MP one and boosting the front-facing camera up to 5MP. Given that Apple tends to stick with camera components for a long time we wouldn’t expect to see a change in megapixels for the iPhone 7, but there’s a good chance it will have performance tweaks and additional features to help set it apart. Optical image stabilization perhaps? As for the iPhone 7 Plus, trusted analyst Ming-Chi Kuo at KGI Securities in Korea believes the larger phone may go for a dual-camera set up. It would allow for optical zoom and give a wider field of view in shots – but it’s not exactly certain why this feature would only be on the phablet version of the iPhone 7. The analyst also said he believes there may be two versions of the iPhone 7 Plus, one with this camera set up and another without. It’s all just speculation right now, but there may be something in. As for the battery, there’s no news yet. It was one of the greatest failings of the iPhone 6S, so we’re really hoping for some improvements here. Sadly, though, if the phone does slim down further as is being rumored there’s not much hope of a big juice pack. The iPhone 7 could be in for a huge performance boost, with whispers on Weibothat the phone will pack a hexa-core A10 chip, up from just a dual-core processor in the iPhone 6S. We’re sceptical that Apple would go for that much of a jump, but it’s an exciting thought. We’re not likely to see any more RAM in the iPhone 7, as Apple only just pushed the iPhone 6S up to 2GB, so it will likely stick with that for a while yet. As for the OS, we’d expect to see the iPhone 7 land with iOS 10, since we’re up toiOS 9 on the iPhone 6S. But rumors of what we’ll see in iOS 10 are thin on the ground. A whole slew of possible features are apparently in testing for the iPhone 7, with five different prototypes being used to test multi-Force Touch tech, a dual camera, wireless charging, a fingerprint scanner in the screen and a USB Type-C connector that’s compatible with headsets. That all comes from a post on Weibo, but even if it’s true given that there are apparently five different prototypes much of this may not make it into the final phone. In other rumors the iPhone 7 could have a smaller headphone jack than the iPhone 6S. We’re hesitant to call this a feature, as it’s more a likely annoyance which could be necessary in order to further slim the phone down. There’s an Apple patent which points to a 2mm connector, down from the standard 3.5mm headphone jack found on most phones. That would certainly help Apple slim the device down, but would also mean you’d either need special headphones or an adapter. There aren’t any price rumors yet but in all likelihood the iPhone 7 will cost roughly what the iPhone 6S currently retails for, specifically £539/$649/AU$1,079 upwards. Though if Apple finally ditches the 16GB model the starting price might be even higher. Leave a Comment on Waterproof iPhone 7 Cases Coming Soon! Waterproof Samsung Galaxy S7 Cases Coming Soon! Get ready everyone! The Galaxy S7 and the Galaxy S7 Edge is coming soon! This increased weight shouldn’t be a deal breaker as it comes due to significant improvements to practicality (more of which next). Galaxy S6 owners will see little about the ongoing use of aluminium and glass to inspire them to upgrade, but owners of the famously plastic Galaxy S5 could be tempted given the dramatic increase in build quality from their model. Leave a Comment on Waterproof Samsung Galaxy S7 Cases Coming Soon!